come in all rockin hues. and cards we must CASE. 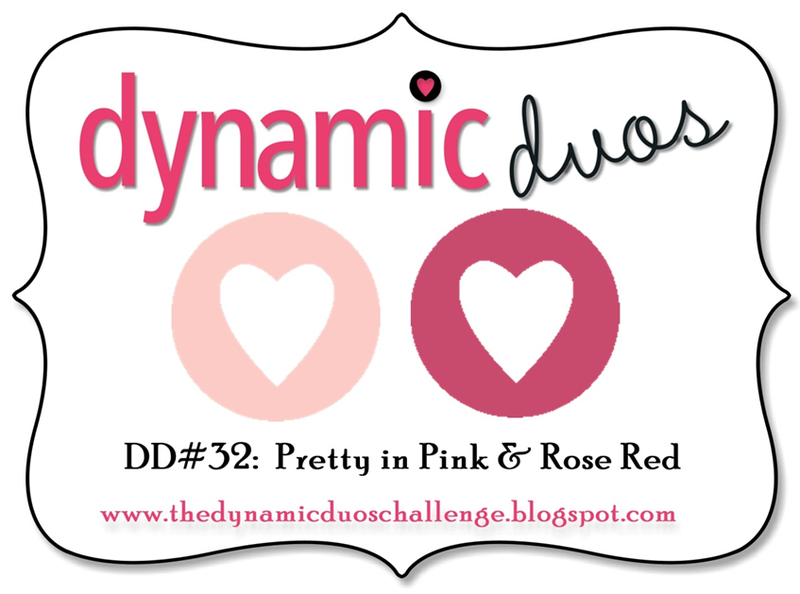 Dynamic Duos is having a mono chrome week and the colors are pinks. Mojo Monday is ending in mere hours. It is a contest challenge and the fun sketch was created by the talented Carole Burrage. Using snippets is all you need to do to join in the fun at Pixie's Crafting Workshop where we are at Week 50! This time of year, high on sugar, we are all quiet delinquent and naughty. Hmmm, no. I don't think one can be quiet AND delinquent and naughty. Perhaps a better word would be "quite." Try that. I'm off to make the remaining seven, which I'll post another day. Before you go, I'd like you to meet Kristen, a new follower who came to the door yesterday. Welcome, Kristen! Your picture thumbnail does not link to your website, so if you have one, please let me know, so I can send you visitors! And Nancy Lynch, wherever you are, thank you so much for your giant pat on my back a few days ago. I can't find you inside my monitor to tell you personally, so I'm hoping you see this heartfelt thank you! Enjoy your day! No, seriously, enjoy your day. Remember it IS acceptable to send holiday cards after Christmas!! Well, for that matter, heaven knows the postage service can be quite unreliable. Wink. Take a breath. And perhaps a tipple. like any of the card deets. Awesome poem, hun! LOVE it! your fab and funky cards are great too. Great lyrics and love those funky cards. Could have sworn I was following you but nope can't see me. OK. Can you see me now. I'm over here by the Reindeer. Hugs Mrs A. Fantastic poem and I'm sure those cards will go down well too. Love the poem! Super creative!! Great poem and super cards Darnell, love the cocktail and initials theme too! Great cards Darnell! Thant image in the martini glass is fabulous! You have been a busy little cardmaker indeed! Darnell, I swear I laugh every single time I come visit you :) That poem is AWESOME. And true. THat's what makes it so awesome. And the lateness of my holiday cards...that's why I generally prefer them to say 'happy holidays'. New Year's is a holiday. So is Valentine's. You amaze me! A poetess also??!! Fabulous cards, Darnell! Loved the fun ditty - is there no end to your talents? Your cards are gorgeous, and poem is brilliant. Oh your poem is so on the nail Darnell - love it. You have been so productive with your letter cards and I love how you have made them look so different. Love, love, love your poem!! I also love the initial cards! Oh Dippy - your ode is wonderful and I'm so going to steal it!!! hehe.......... sorry, that should read CASe it.......my mistake! lol I love the girlfriend's cards and especially that you started with the initial "k"........thank you! PS. Love the cards you made! Darnell your Christmas poem is excellent! I love that your daughter asks you for help and I love the cards you made. So creative. What fun cards! Love the poem! Super fun post. I love the poem..it's perfect. And as always your cards are great! So glad you were able to link one up for this week's Dynamic Duos. What a fabby little poem .. .. you are clever!!! Great cards too. Lots of snippets used up there!!! p.s. My Christmas tree isn't real but it does fool a lot of people LOL!! Very poetic and fun post again Darnell. And your cards are so fun! I am sure they will be appreciated by their recipients. Love your poem ~ Love the cards ~ Hmmm ... I definitely see a drinking theme here ... can hardly wait for the next 7! Lol... that really did make me laugh out loud - love your Ode and your cards, just gorgeous! Thanks for sharing them with us at Dynamic Duos. What a great poem...who knew you were such a poet. Very nice cards. I'm sure the girls will love them.